What If Nobody Shows Up………? It happens. That unanticipated moment when you – the facilitator – are there, and nobody shows up. I remember with a mixture of anxiety and humor the first time this happened. 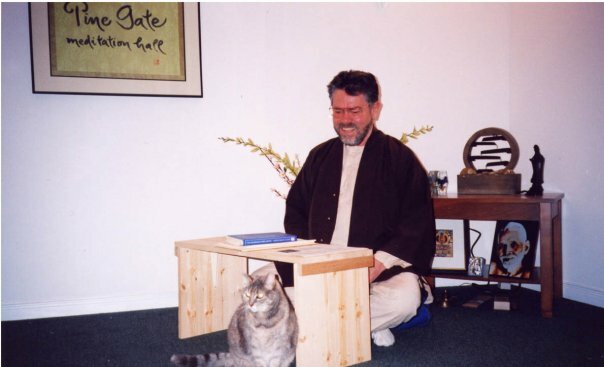 One fall evening I had cleaned the Pine Gate Meditation Hall, set the cushions in a neat semi-circle in front of the simple alter, meditated beforehand, and made sure the notes for the Dharma talk were ready. And nobody showed up. At first I thought friends were just a little late, but thirty minutes past the hour convinced me that nobody was coming. I was disappointed and remained so, until two beautiful beings caught my attention. My dog, Nikki, and my cat, Lady, were sitting patiently close by me in the meditation hall, waiting for my attention. They were fully present, only I was not. When I did notice them, I smiled. Only then could I look deeply at my thoughts. What in fact was disappointed? My ego, expectations, habit energies, and mental formations – these were all certainly disappointed. Yet the moment I smiled to my loving animals, the disappointment began to fade away. 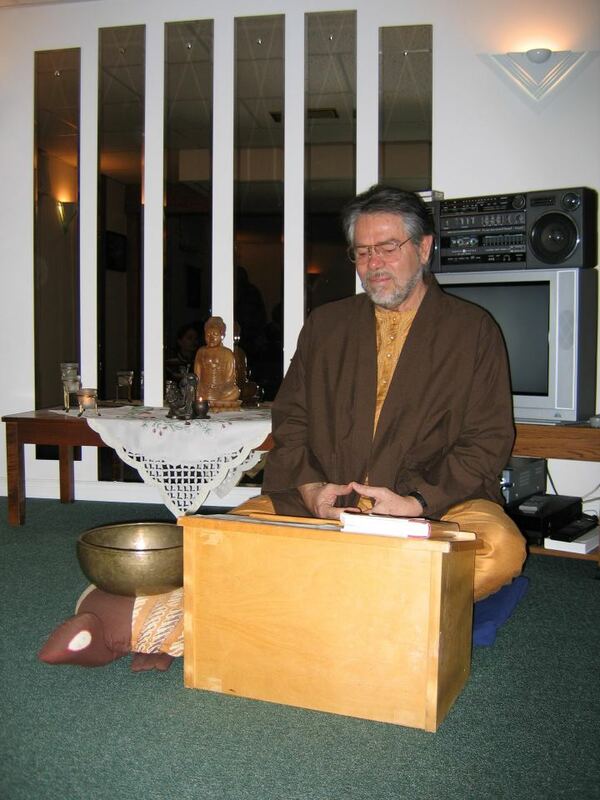 I was left with the insight that of the many elements necessary for a sangha facilitator, on this night it was Equanimity with a capital “E” that I needed most to nurture. After inviting the bell for Nikki, Lady, myself and absent friends, I meditated on the Four Brahmaviharas – Love, Compassion, Joy and Equanimity – the Buddha’s teachings on Love – with a particular emphasis on the Fourth one – Equanimity. The following evening, the doorbell rang at 7.00pm and two friends from the sangha came in, followed by another three, then five minutes later by another four. I welcomed them with surprise at seeing them. They were puzzled by this welcome, then told me that this was our sangha evening. I had prepared for them the day before in error! We all laughed until the tears rolled down our cheeks when I told them the story. Our meditation and gathering that night became known as the Night Of Warm Smiles And Quiet Chuckles, as once again Nikki and Lady joined us. Not surprisingly, after meditation, our discussion was about Equanimity. Of how we can so easily get caught in our projections and mental formations when Equanimity is absent. Also we shared at length our experiences of its interconnection with Love, Compassion and Joy – the remaining trio of the Four Brahmaviharas. To make this come alive we all knew that our practice had to become more skillful, drawing on one another’s support. The second track of the Pine Gate Meditations CD is about the Four Brahmiviharas, based on the Buddha’s teachings on Love. The gentle offerings on this hour long CD nurture the heart so that love and understanding are nourished. The Buddha’s teachings on love were first given to a Hindu Brahmin, who asked the Buddha to tell him how he could be with Brahma, the universal God. The Buddha replied with a practice devoted to cultivating Love, Compassion, Joy, and Equanimity in each moment, and he expounded with great clarity on the nature of these four components, all of which are interconnected. They are also known as the Four Immeasurable Minds, as the potential expansion of each one is infinite, each one can embrace the entire world and universe. There are many things I could write about Pine Gate sangha practice – our hikes in the forest, finding a quiet place for a Dharma talk, then on to a waterfall for a silent and mindful lunch. Of the generosity of sangha members as they take their practice out in an engaged manner. The sangha practices in the true spirit of engaged Budhism with the introduction of mindfulness practice into city schools, and the formation of Citizen’s Coalitions to protect the city environment from inappropriate development, and peace celebration days to bring about an end to war. The other groups in these Coalitions are quite happy to find a meditation group at their core, and I do believe we assist them with our steadiness There is so much more – yet for me the Evening Of Warm Smiles And Quiet Chuckles after the Day When Nobody Showed Up, provides a benchmark for the qualities actively cultivated as a basis for sangha practice. Whenever I talk about the Buddha’s Teachings on Love, usually at our Christmas gatherings, the sangha revisits this benchmark.